Vizhinjam Rock Cut Cave, a historic spot which was left unnoticed for a long time is situated at Vizhinjam, 17 km from Thiruvananthapuram city. Just 1 km away from Kovalam, it is an ideal for one day tours. Vizhinjam, the seaside village was once the capital of the many Chieftains who dominated the southern parts of Kerala around the 8th century AD. Vizhinjam also was a former Dutch and British factory, of which nothing can now be seen. The place is home to some of the earliest architectural remains in Kerala, dating back to the 9 C -10 C.
Vizhinjam Rock Cut Cave contains the 8th century rock cut sculptures. The cave encloses a one celled shrine. 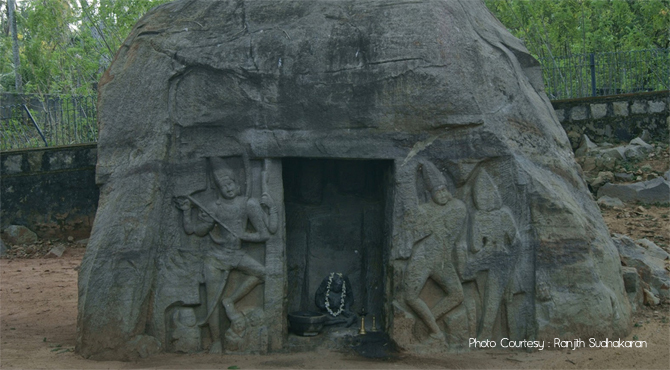 Dedicated to Vinandhara Dakshinamurthi, this granite cave temple were constructed using a number of Tamilian features. The outer wall of the cave has unfinished sculptures of Lord Shiva holding a bow and Dancing Lord Shiva with his wife Goddess Parvathy. Temple timings: 9 am-6 pm. Closed on Mondays. One of the busiest fishing harbour in Thiruvananthapuram, the sight of hundreds of fishing boats, women taking head loads off to local markets, fishermen gliding into the sea are delighting. The beach also offers a fine sight of Vizhinjam mosque. Even though the beach is good for enjoying scenic beauty, it is a dirty place with fishy smell. Established in 1997, Vizhinjam Marine Aquarium is situated near Theatre Junction. Even though, the aquarium is poorly maintained, it houses rich collection of world’s rarest and most exotic species of invertebrates and ornamental fishes such as Crabs, Squirrelfish, Clownfish, Moon wrasse, Butterfly fish, Lionfish, Giant turtles, Aggressive surgeonfish, Triggerfish, Deadly piranhas, Sharks etc. It also has a unique display of pearl images of Christ, Virgin Mary, Hindu Gods and Goddesses and other images. The aquarium is managed by the Central Marine Fisheries Research Institute (CMFRI). Entry Fees: Adult 10/- and children 5/- , Timings: 9 am-6 pm. Ph: 0471-2480224, 2483324 .